In recent years, the number of iron sights for sale at gun stores has gone down significantly, and if this isn’t a testament to the effectiveness of an optical scope, then we don’t know what is. Along with being ‘tacti-cool’, they make the entire shooting experience a bit more fun, and a lot more effective. The bottom line, is that scopes are an outstanding addition to virtually any rifle, whether you’re sitting at the end of the range, or crouching in the bush, waiting for the kill. Scopes allow us to see the target clearly, they allow a more precise aim, and quite frankly, it’s no surprise that so many people are choosing the scope over standard sights. If you’re new at this, then you’re probably going to run into a very serious problem: you won’t know what scope to choose. Don’t worry, you’re not the first person to experience that, and you won’t be the last. There are so many, all with different features, jargon, and capabilities. We’re going to give you a quick walkthrough that should help you to figure out what type of scope you need, and most importantly, what type of scope you don’t need. The two items mentioned above are separated by an ‘x’, so, for example: 3-9x32mm. Sometimes, you will see the two numbers with a magnification dash between them, which tells you that the level of magnification can be adjusted from the lower number to the higher one, so, for example, if the number is 3-9, the magnification begins at three and can be increased to 9x. The second value is the diameter of the lens, which obviously cannot be changed. On the subject of the lens, the forward lens will hereafter be referred to as the objective lens. So, you’re all ready to purchase a scope, and maybe you’re standing in a store right now reading this, but first, you’re going to want to determine what magnification you will need. The magnification will really determine how useful the scope is going to be in the field, so let’s look at some practical examples. If you’re on a bench rest shooting at 1,000 yards, then you wouldn’t do very well with a 4X scope – at that point you might as well be using iron sights. On the other hand, if you’re in the field, say a thick forest, then you wouldn’t want to use a 32x scope. Actually, it would probably be pretty useless. 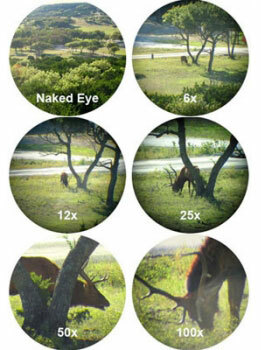 Lower magnifications will automatically be better for faster shooting, say a 4x or a 6x, but higher magnification means better target resolution. Bear in mind that anything with a higher magnification will be larger, heavier, and probably more expensive, so think twice before you spend a lot of money on a scope that you don’t want to carry with you through the bush. So here you are, you know what magnification you need, but what size lens do you want? That’s the second part of the equation that’s probably been eluding you. The objective lens, which we mentioned earlier, transmits the ambient light so that you can focus on an image, a larger led gives you more light, which means a clearer image. If you want a brighter, clearer image, then yes, go for the larger objective lens, but remember that they have their own set of issues. The primary issue with an objective lens is that of space, for example, a larger lens needs to be mounted higher over the barrel and action, which can cause issues with your cheek. Ultimately, it may lead to inaccuracy, so make sure you’re ready to get a lot of practice if you’re going to use this type of scope. As if you didn’t have enough to worry about, you also have to consider the reticle type. There are dozens of different patterns out there, from a simple dot, to a complex grid. That said, we’re only going to talk about two of them. • Mildot – This reticle is similar to another, called the duplex (a simple crosshair) but it has several enhancements. For example, there is the size and spacing of the dots along reticle lines which correspond to specific angles. The mildot is currently used by military and law enforcement snipers, and with good reason. Most often, this scope type is great for distances beyond 300 yards, making it one of the best choices for long distance shooters. • BDC – It stands for Bullet Drop Compensator, in case you were wondering. BDC’s are becoming more popular today, and they’re great for shooting targets at differing ranted without needing to change the elevation setting. The only problem is that they are only accurate at ranges beyond 500 yards, so if you were hoping to shoot a closer target, you’re out of luck. 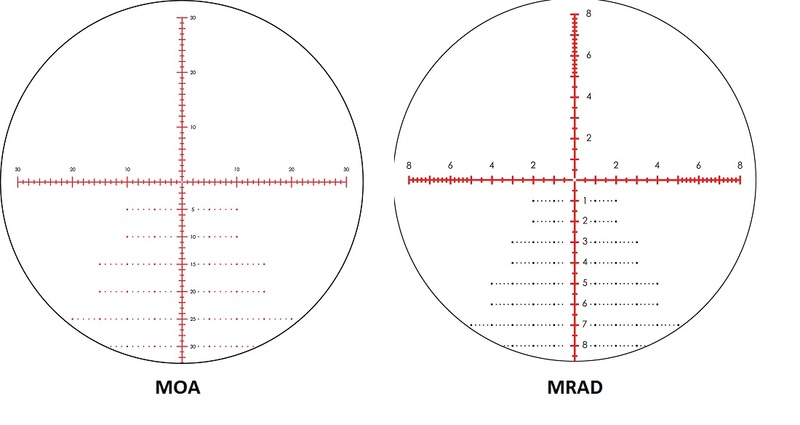 Now you know the power you need, and you probably know the reticle you want but now it’s time to answer another question: MRAD or MOA? • MOA – Stands for Minute of Angle and technically indicates 1/60th of an angular degree. More often than not, this is associated with linear inches, with 1 MOA corresponding to 1 inch at a distance of 100 yards. This allows for very precise zooming, as the adjustment increments are small. For long range shooters, the MOA scope is ideal. • MRAD – Stands for Milradian, and is often abbreviated as MIL. 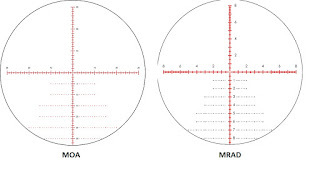 Just like the MOA, the MRAD represents as a fractional section of an angle, and 1 milradian is 3.6 inches at 100 yards. Compared to the MOA, that’s a bit large, and that means you probably aren’t going to get the same precise adjustments. The good part, however, is that you can make simple adjustments, even though the adjustment knobs tend to be a liability in the field. The next item you’ll want to look at is the focal plane which presents itself in two positions, the first focal plane, and the second focal plane. Most scopes use the second focal plane, or SFP reticles, meaning that when the magnification level is altered, the reticle stays the same size. In the First Focal Plane (FFP) however, the reticle will actually scale up and down throughout changes in the magnification. For this reason, any milradian or BDC markings are completely accurate, regardless of what the scope is set to. This is a slightly more advanced feature that can be found in many scopes, and it simply means that the reticle will appear to alter its position in relation to the target. 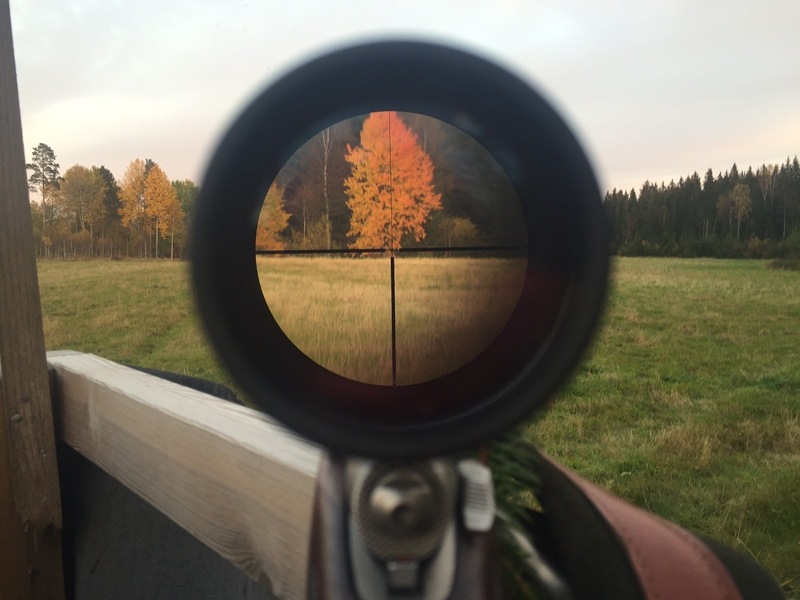 In the case of most low magnification scopes, you will be parallax free at certain distances, say 100 yards as an example, and it will simply not be able to correct at close ranges. This is not a problem, as most scopes, at that range, would not really be able to register the shift, or it would be far too small to matter. If you want to eliminate parallax without using an adjustment knob, you can pull your head back until the scope shadow is equal on all sides – this keeps your eyes at the same spot, and will also save you some time. How Much Should You Be Spending on a Scope? So now we finally get to the tough question: how much should you really be spending on a rifle scope? This is hard, because you might have had an idea coming in, but now that you know all of the factors, you’ve probably had to adjust your ideas and maybe even your expectations. Here’s a fun fact: most people don’t realize that rifle scopes are so complex! You see them in movies, or maybe you’ve witnessed someone using one, but the technical details often escape those who are looking to make a purchase. After reading this, you’ll probably come to the conclusion that rifle scopes cost a lot of money, and you would be right. So, how do you find one that fits your budget? The most important thing for you to remember when you are in the market for a rifle scope is that yes, you can pay thousands of dollars for a good scope if you want to, but you absolutely do not have to. Think about this: commerce is better than ever, and you have more options than ever before. That said, the market for scopes is huge, so you can find the features that you want on your scope at a lower price, and you can probably find one at the same quality. The market is competitive, use that to your advantage. Don’t go too cheap when you’re looking for a scope! This industry is just like any other: you get exactly what you pay for, and you don’t want to pay for a cheap rifle scope. The last thing you want is to find that it completely fails you while you’re in the field. Honestly, you should budget at least $200 for a basic scope, though if you can hit $300 you should be able to find something of decent quality. By dedicating $300 to your purchase, you will be able to jump on the advanced features like parallax adjustment, reticle illumination, and much more. You need to be very specific when you’re looking for a scope; there is really no room to fool around here. Fortunately, you have the internet, and most importantly, you have this article. There are so many different types of scopes available, and quite a few ways for you to find exactly what you need. Assuming you don’t want to do your shopping online, make sure that you know the terminology as you walk into a gun shop so that you can make the right decision when the time comes for you to lay your money on the counter. Finally, if you are having any doubts, make sure you’re willing to shell out a bit more for a good brand name. The last thing you want to do is waste money on a cheaper scope, as they simply won’t perform in the field when timing matters. So, now you know how to plan your purchase, and how to find the scope that you need. Move forward, speak to experts, and mount the scope that will make your experience outstanding. Here is excellent optical power rifle scope. All of the scopes that you have mentioned will satisfy our budget, however may also come up with crystal clean sight and precision so that you can get your target each single time. So, prevent losing valuable time and high priced ammunition and get a satisfactory scope that you may rely on.